We spent 9 days traveling through 8 states stopping in Louisville, KY for the Southern Baptist Convention. Stayed a night on the road in Birmingham, AL with our dear friend, Kaylie. We reunited with college friends in Pensacola, FL before beginning our retreat in Laguna Beach, FL. After the retreat, we traveled to Albany, GA where we met with Sherwood Baptist Church about their partnership with us in San Francisco. We said goodbye to Mimi and Pops and began the long journey home. The trip was definitely a working trip, but was very enjoyable. The boys were troopers as they never knew what state we were in and where they would lay their head. We spent time with Pops at the Southern Baptist Convention. We spent extra time with Mimi at the Beach Blast Retreat. We witnessed baptisms of teenagers at the retreat! 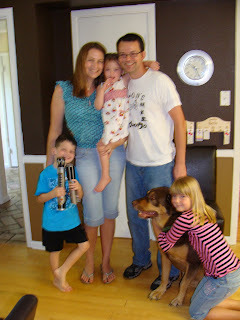 We spent great time with college friends, Mary and Brad Keel and their kids, Carter and Belle in Pensacola, Florida. We traveled from Albany, Georgia to Ozark, MO in one day resulting in a 14 hour trip. The boys did GREAT! God was very gracious to us. We ate at the Dairy King in Portia, Arkansas, where we ate on our moving trip to Missouri. Although the city only has like 185 people, they certainly know how to fry some catfish and dip some ice cream cones! Yummy!